Where do I begin?! From the beginning, my whole experience with Jordan has been nothing shy of AMAZING! Jordan is so incredibly knowledgable of this breed and truly passionate! Her love and dedication to French Bulldogs is evident! Upon reaching out to Jordan with a request for information, she was helpful, friendly, and enthusiastic! From that first conversation I knew......I knew I would end up getting my newest family member from Jordan! Fast forward 8 months, and I now have Conan, my handsome French bulldog! From the day we brought him home, and every day since, Conan has brought us such joy! His temperament is ideal: calm, cuddly, yet playful and social. Conan is a healthy, happy 10 month old piggy! :-) He is a favorite in the neighborhood for sure! Over the course of these last 8 months, Jordan has been there every step of the way! It's a wonderful feeling knowing that when I have a question or concern regarding Conan, that she is only a text away. She prides herself so much on her breeding and her frenchies and ensures that the adoption process continues even after the puppies go home. I could go on for days about all of the wonderful things she has done for Conan even after he came home! Her generosity extends far beyond what I could have ever imagined. 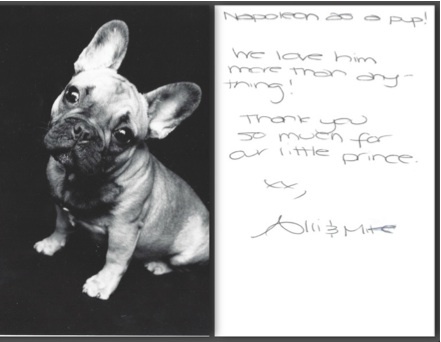 Jordan is a one-of-a-kind breeder who loves her frenchies and the families who are lucky enough to adopt her pups! Thank you Jordan for a perfect adopting experience! I can't wait to get Conan a brother in the near future!